This week has been pretty busy. I haven’t stitched on this as much as I hoped to. However I think that house number two is more than half finished. 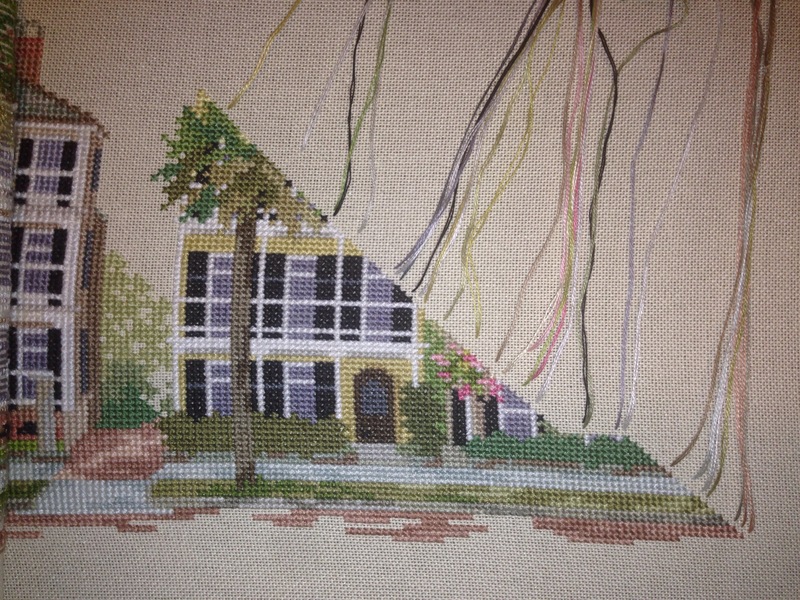 I will be excited to stitch the next diagonal because I will be able to see the house’s roof. Hello! I’ve been working on this pattern myself. Recently I ran into an issue with my pattern. I have a symbol that does not correspond to a DMC number/color. Can you tell me the yellow color of the second house? Thanks for your help! Which symbol? There is more than one shad in the yellow house. It’s a number 6 symbol with the circle part shaded in. Do you have a symbol like that on your pattern? Hello, following up on this. It’s the yellow surrounding the shutters and windows.